"Virtually every mission area" faces critical manning shortages, according to Chief of Staff Gen. Mark Welsh, and the Air Force risks burning airmen out. "We're at 82 to 85 percent manning levels in virtually every mission area," Welsh said during a discussion Tuesday at the Atlantic Council in Washington, D.C. "We can't reach in someplace and grab more manpower to fix a problem anymore. And so we have got to figure out different ways of using our people in a more efficient way or we will wear them out. And if we lose them, we lose everything." One reason for the undermanning is that the Air Force is far smaller than it used to be, while its responsibilities are increasing, Welsh said. In 1990, for example, the Air Force had more than 535,000 active-duty airmen. A quarter-century later, the Air Force had an end strength of 312,980, a roughly 41 percent decline. But at the same time, the Air Force has had to build new capabilities such as increased intelligence, surveillance and reconnaissance, and field squadrons of remotely piloted aircraft. And the Air Force has had to make some painful choices to fill those needs, Welsh said. "There is no excess capacity," Welsh said. "We cut entire fighter wings to buy new RPA [combat air patrols]. We needed to, by the way, but that's the kind of decisions we've been forced to make. "As we've built a 35,000-person ISR enterprise over the last 10 years or so, we have cut the Air Force 50,000 people. Which is essentially an 85,000-person cut to the rest of the mission areas. So they've all been thinned out to build this critical new capability, which we needed to build." Welsh said he hopes the effect of that thinning is not irreversible, but he also pointed out that manning is not going to return to previous heights. Aircraft maintenance units, for example, have been struggling in recent years to field enough maintainers such as experienced crew chiefs and avionics airmen. Welsh did not mention that area specifically, but several Air Force officials have spoken in recent months about the maintenance shortfalls. Col. Patrick Kumashiro, chief of the maintenance division for the Air Force's Logistics, Engineering and Force Protection Directorate, said in an Oct. 15 interview that he gets worried anytime manning drops below 90 percent. But manning for some ranks of crew chiefs and avionics airmen has dipped into the 80 percent range, or in some cases into the 70s. 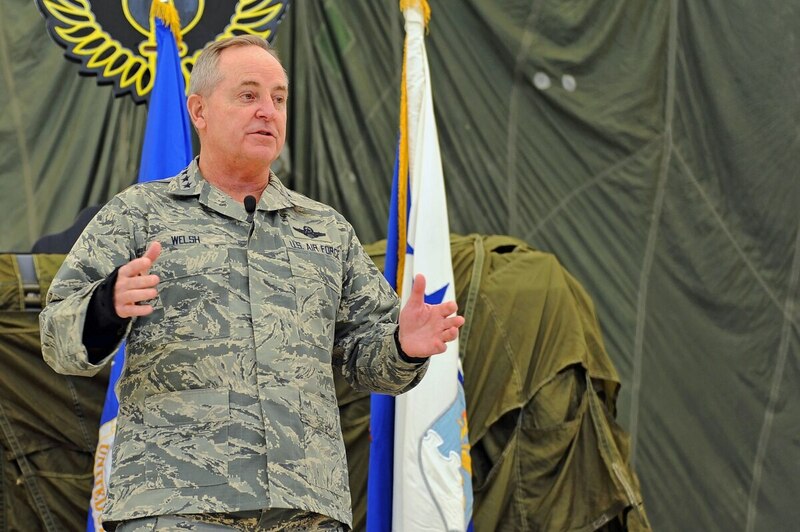 To solve some undermanning problems, the Air Force is expanding selective re-enlistment bonuses, offering high-year tenure extensions, and making it easier for Air National Guard and Air Force Reserve members to move to active duty. The Air Force also is allowing some separated airmen to come back on active duty through prior service accessions.